Special “Made in the USA” editions of the J/70 and J/88 will be used in the Premiere Sailing League series. 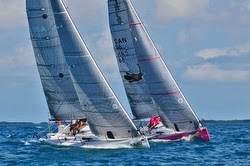 For more information about the Premiere Sailing League USA go to www.premieresailingleague.com or Facebook. Benjamin Klatzka will be available for questions at Key West Race Week and Boot Düsseldorf (Germany). Please contact him at info@premieresailingleague.com. Ray goes on to report that, “she hasn’t disappointed. Since arriving in Sydney, we have competed in some harbour and offshore races and we are just blown away with her sailing performance and attributes. Here is a short summary of races so far. 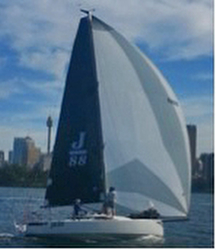 For her very first races, the J/88 “JEDI 5” has competed in a few twilight races at Greenwich Flying Squadron. She wasn’t able to start in the division of similar sized boats due to the early start time. Hence, the J/88 competed in a division with a later start time, comprising 37 to 39 footers. However, this has not fazed the J/88 where she is currently leading the series, with a 2nd as the worse result. 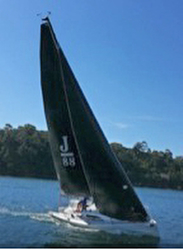 On the second weekend of October, JEDI 5 sailed in the very hotly contested Super 30 fleet on Sydney Harbour under the AMS (Australian Measurement System). Although not many boats entered for this event, the J/88 finished 1st by an astonishing 11 minutes with guest skipper Jim Chambers. Jim has dominated this event for the past 3 years with his highly successful J/97 KNOCKABOUT. The following weekend, the Super 30 Gold fleet was racing on Sydney Harbour with more boats guaranteed to turn up, and so they did. Flying Tigers, Bull 9000, ID35, Melges 32, Sydney 32, Cape 31, Hick 31, Archambault 32, Elliotts, Thompson 870, to name a few. Making a conservative start in an 8 knots nor’easter breeze, and with 50% of the crew new to the boat, JEDI surged around the top mark at South Head ahead of some of the Flying Tigers and the M32 boat-for-boat! The breeze started to build to 16 knots, the J/88 recording impressive speed and depth downwind. Back upwind we go the wrong way up the beat, so the Flying Tigers get through as they pick the right side of the harbour. The second reach back down the harbour and the Melges 32 pips us to the bottom mark for the last time. A short beat to the finish line and despite the slow start and going the wrong way there still a lot of boats behind us. The new crew members were surprised at the pace and how easy the J/88 was to sail. After an anxious wait for the results, the J/88 had kept her impeccable record intact with a first on AMS complimented by another first on the local PHS system! It was then time to take the J/88 to Royal Prince Alfred Yacht Club on Pittwater, north of Sydney, to do a few races there. She is placed in Division 2 and is the smallest boat at 29ft, the next boat at 34ft and right up to 40 footers. It was an offshore race with a lumpy 1 to 1.5 mtr swell, gusting to 18 knots from the nor’east. 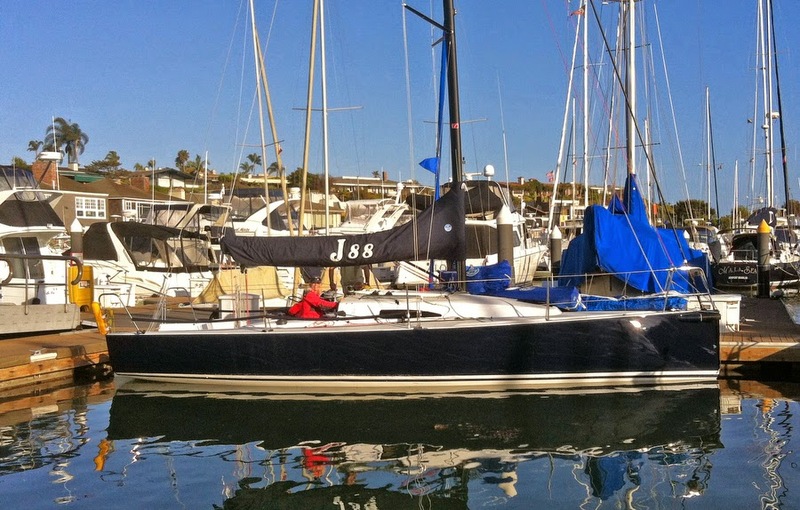 It was the first time for this J/88 in waves, and more breeze than she has sailed in before. The crew was pleasantly surprised by its performance. We put the crew weight a little further back, and the boat steered very easily through the waves, pointing quite high with superb speed. Despite being in unfamiliar waters, the J/88 was first around the top mark. Up with the class 95 sqr mtr running spinnaker and whoosh off we go. Downwind, the boat has a very light helm, only moderate sheet loads, and incredibly smooth handling as we planed down the waves. An amazing kite ride to the bottom mark, dramatically extending our lead. On the next beat, we start to haul in some of tail end of the Division 1 boats! We experiment moving the crew weight fore and aft up the next beat as we learn more about this stunning 29 footer. Around the top mark again and another fantastic spinnaker ride, surfing the swell to the finish line. 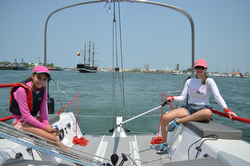 We blasted through the finish line clocking 16.2 knots, our fastest speed to date on the J/88! SAIL Best Boats Winner- J/88 Oceanvolt! (Boston, MA)- Few builders are consistently willing to push the technology envelope and accept the risks that entails. Remember 1991 and the world’s first sprit boat- the J/105? This fall saw the introduction of the world’s ground-breaking Oceanvolt electric saildrive on the enormously innovative, all-electric J/88 from J/Boats. The Achilles heel of electric propulsion in boats is the high level of energy it takes to power at cruising speeds since large battery banks are required for any kind of substantial range. However, the J/88 Oceanvolt model is impervious to this in as much as the propulsion system is needed only to maneuver in and out of slips, after which the boat is sailed. Few are consistently willing to push the technology envelope and accept the (often considerable) risks that this entails. In the mass production marketplace, Groupe Beneteau stands out. In the high-end custom marketplace it is Gunboat, with this year’s G4 as a quintessential example. It’s not just the G4’s foiling capability, which has grabbed the headlines, but also its clever foot-operated hydraulic mainsheet trimmer, creative engineering in terms of foil control, Pontos four-speed winches and a retractable electric saildrive from Oceanvolt, an up-and-coming Finnish company. The Oceanvolt is also found on the all-electric J/88e from J/Boats. The Achilles heel of electric propulsion in boats is the high levels of energy it takes to power at cruising speeds (as opposed to the relatively low levels necessary to maintain highway speeds in a car) since enormous and impractical battery banks are required for any kind of substantial range. However, the G4 and J/88e are both impervious to this in as much as the propulsion system is needed only to maneuver in and out of slips, after which the boats are sailed. The batteries in both cases are lightweight lithium-ion. Although Oceanvolt saildrives have folding propellers, Oceanvolt has found a way to trick the propellers into staying open and freewheeling when so desired, with the electric motor now being driven as a generator to recharge the batteries. The J/88e also flies a SolarCloth main from UK Sailmakers, which includes a number of integrated solar panels to further top of its battery banks by generating electricity from the sun. (Coconut Grove, FL)- The J/88 Winter Circuit has an update for J/88 sailors, crew and owners! 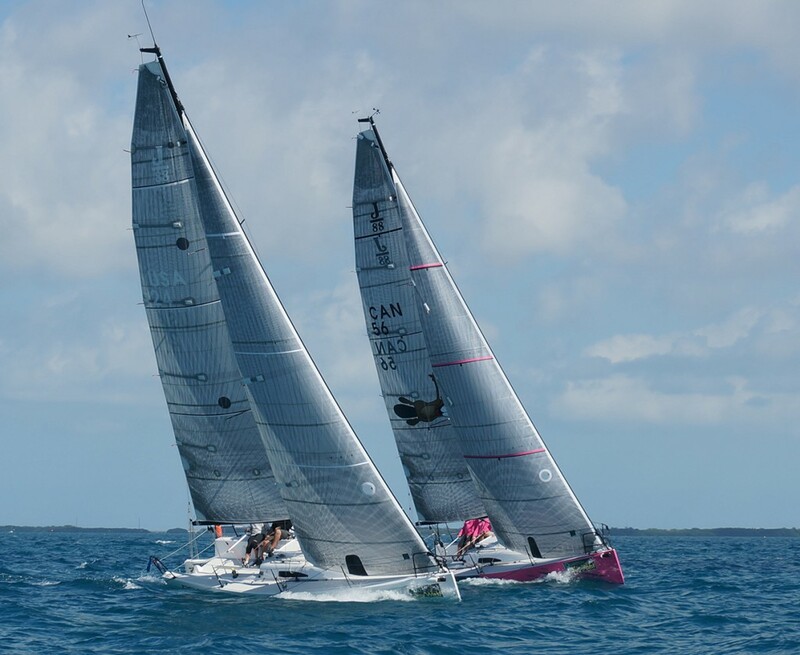 The circuit starts at Quantum Key West Race Week in Key West on January 17-22 for the first J/88 Midwinters and ends with Charleston Race Week in April. There are now confirmed dates and location for the Miami/ Biscayne Bay portion of the J/88 Winter Circuit. (Newport, RI)- J/Boats has given its latest fast racer/cruiser, the J/88 family speedster, an added dimension— electric power. Dieter Loibner, boats.com editor, provides a brief commentary of the innovative system’s components while reviewing the boat at the Newport International Boat Show. Imagine sailing on a beautiful day knowing that, even if the wind dies and you're forced to turn on the motor, peace and tranquility are not lost. Every minute sailing, the battery pack is charging, allowing you to later silently power back to the harbor. 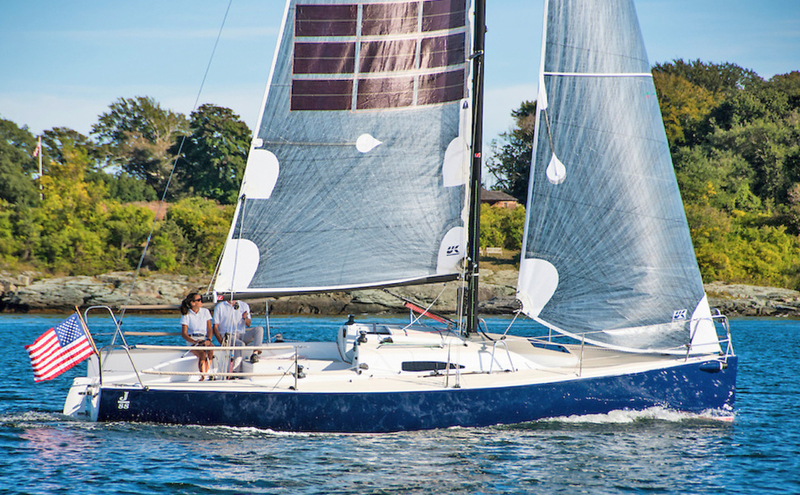 Learn why the J/88 Oceanvolt model is being called "the Tesla of sailboats." "There is no quicker way to break the silence of a beautiful day for sailors than having to turn on the diesel engine," said Jeff Johnstone, President of J/Boats. "Most of our owners will tell you they sail their boats 90% of the time. We would like to improve that other 10% and as well provide a more environmentally-friendly solution for sailors who love the sea." The Oceanvolt SEA system has clear benefits compared to diesel motors, the most significant being silent operation, no emissions and low maintenance. On a full-charge (7.1 kW) there is enough battery power to go up to 20 nm with no sail or solar power support. Add in both of those elements, and the J/88 can go all day "solar sailing" (the solar version of motor-sailing)- with solar mainsail and solar bimini deployed, the 1,000+ watts of power from the sun enables speeds up 6.5 kts- that's 50-60nm! "For the past ten years, we have been developing innovative solutions for the electric/hybrid power market in Europe," said Timo Jaakkola, President of Oceanvolt. "Based in Finland, a country renowned for developing leading edge "green" solutions, our company has pioneered the use of electric power in keelboats that range from 15 to 60 ft and ranging from 3kW to 15kW." The J/88 will feature Oceanvolt's SD6 6kW 48vdc system; which is lightweight (47 kg total) and has full hydro-regeneration capabilities, meaning that you can create energy back to the batteries while sailing using the folding propeller mounted on the sail-drive. Up to 1.0 kW per hour can be generated to recharge the batteries while sailing at 8.5 kts. Unlike diesel engines that require on-going maintenance by qualified mechanics, the Oceanvolt motor has no gears and very few components. In fact, the only moving parts in the entire system are the prop/shaft and the rotor inside the electric motor- just two primary components! An important feature of the Oceanvolt SEA system is the complete integration of Victron Energy's solar power MPPT charge controllers, shore power inverters, and the hydro-generator power. The Oceanvolt RSI is a state of the art remote diagnostic and service interface that lets you check your boat's status from anywhere. Track all the data about the motor, batteries, generator, solar panels & chargers online in real-time. The Victron Energy Color Control GX provides you all the data logs, the ability to set parameters for alarms, and track the location and monitor your boat in real-time. The J/88 Oceanvolt also features the latest thin-film solar powered sail technology from France- the innovative SolarClothSystem. This design incorporates super-thin 65 micron film containing high-efficiency photovoltaic cells that will produce 500 watts per hour. The cells are flexible enough to be used on mainsails that get rolled or folded. The "power bimini" with 8 x 100 watt solar panels is capable of producing up to 650 watts per hour. Recent tests on a partly cloudy day showed the ability to produce over 2.5 kWh from sunrise 8am to sunset 7pm. Here is the graph of that power production curve. The Oceanvolt SD6 electric motor maximum range "power curve" graph shows the comparison of "battery-only" range to "solar sailing" range. The boat has 4 Valence LiFeMgPO4 batteries of 12.8 vdc x 138 amp hrs that weigh 42 lbs each. That's plenty of range for weekend/ day-sailing! WINGS Flies @ J/88 New England’s! (Greenwich, CT)- Eight boats entered the New England J/88 Championships at Indian Harbor Yacht Club in Greenwich, Ct. on Columbus Day weekend. The event was held alongside the Gearbuster distance race, but the J/88s had their own Race Committee and starting area. Saturday began with a shifty northerly breeze that diminished during the morning and changed to a southwesterly in the afternoon. The race committee, with Jonathan Nye as PRO, did an outstanding job in very tough conditions, moving marks numerous times to keep up with the shifts, and managed to get three races in. Sunday, the fleet was sent out an hour earlier and got five races in a 12-14 knot breeze from the southwest. The racing was close, fast paced and exciting. Some drama ensued in race seven, when Cloud9 lost a crew member overboard at the weather mark, but they managed to pick her up and hoisted their chute, all in less than a minute, well done! After eight races, the winner with 8 points was the newest J/88 owner, Mike Bruno on WINGS, whose American YC team had an outstanding performance. Second place with 16 points went to John Sommi on CLOUD9 and Kevin Marks’ VELOCITY from Noroton YC took third with 24 points. Rounding out the top five were Iris Vogel’s VELOCITY from Huguenot YC in 4th and Doug Newhouse’s YONDER from SailNewport in 5th. (Greenwich, CT)- What a fleet! Eight boats are turning out for the inaugural J/88 New England Championship. The event runs from October 9th to 11th and will be hosted by the Indian Harbor YC in Greenwich, CT. The forecast will be challenging for the competitors, with fresh southerlies on Friday in the 8-14 kts range followed by a frontal passage and a dying NNE on Saturday from 15 kts dying down to 5 kts, followed by a classic, cool, WSW seabreeze Sunday of 5-12 kts. Not an atypical fall weather pattern on Long Island Sound! (Greenwich, CT)- From October 9th to 11th, the Indian Harbor YC will be hosting the inaugural J/88 New England Championship on western Long Island Sound. Six boats are entered so far and rumor has it that more New York and New England boats are planning to attend. Current Charleston and Block Island Race Week champion DEVIATION is registered and her owner/ skipper, Iris Vogel from New Rochelle, NY, are looking forward to the event. In addition, another Block Island Race Week class winner, Mike Bruno, is sailing the new WINGS- a hot, new, J/88 with a black+red color scheme (seen here above)! 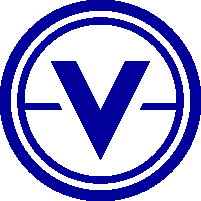 Mike’s crew from American YC will be looking forward to their first “trial by fire” against veteran 88 teams. 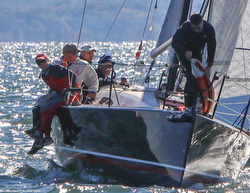 Attending from Newport will be Doug Newhouse’s YONDER and, furthermore, the new owner of 88 hull number “1” JAZZ, Doug Mckeige from Mamaroneck, NY, will also be looking forward to “go speed” tips around the track from fellow 88 sailors. For registration and sailing information. For more information about Indian Harbor YC. For the Fall series, McMichael Yacht Yard is offering a steeply discounted launch/haul package for any 88's arriving by trailer. McMichael will launch and retrieve boats from their Mamaroneck yard for a flat fee of $200 round trip, including trailer storage. With an owner (or owner’s representative), McMichael will also step, tune and unstep the rig for an additional $225. Contact service@mcmyacht.com to make a reservation today! I’m not sure why I never did a LYRA in the past. Possibly because the Level Regatta was always the week before or maybe I just wasn’t invited? I’d always heard stories about it (mostly the parties) and hoped that I’d have a chance to attend at some point. When Jim Egloff mentioned that he might want to take the J/88 down to Sodus, I thought that it would be a good opportunity. I’d done a lot of J/70 big fleet one design regattas over the past two years, so a “big” boat PHRF regatta sounded different and fun. It was also an opportunity to crew instead of drive and really get a better sense of what the J/88 can do on the race course. Before registering for the regatta, we needed to get an updated PHRF certificate and see what rating we’d be given. The original PHRF number when the boat came out was 87, however we sailed at 81 last season on Lake Ontario due to the 6 second “protect the fleet” penalty. Now, one year later, we expected the number might stay the same or even go up a bit given we had some data to work with. I was a bit surprised to find out that we actually dropped down to an 80 PHRF number…ouch. I won’t get into all of that now, but it just meant that we would need to sail well to compete at that number. We were placed in PHRF 1 with all the fastest PHRF boats including a J/124, C&C 115, two Beneteau 36.7’s, and two J/35’s. This meant that we would be the smallest and technically the slowest in the fleet and although the boats owed us time, it also meant that we would have some challenges to deal with. In a one design regatta, you know if you are going fast or not because the boats should be equal. That is not the case in PHRF. Also, tactics change from one design to PHRF and at times it can be frustrating because your plan often gets foiled when a bigger faster boat sails right past you or from under you or over top of you. In other words, you get dictated more than you might care for. We knew that upwind we would have some issues holding lanes, sailing as high or fast as some of the bigger boats with their genoas. We knew that some conditions would favor us and some would favor them. It was about staying patient, especially upwind, and staying close enough at the windward mark in order to catch them downwind. We were also the only asymmetrical spinnaker out there which meant our downwind angles would be quite different. Luckily, we had a good crew with Jim Egloff driving, Kris Werner calling tactics, Justin Hays trimming (both from Quantum Sails Rochester), Nick Egloff on bow and myself trimming main. We felt that our boat handling would be above average, our boat and sails were new, and we had done our preparations to be ready to race. My Dad told me before the regatta that in PHRF “every dog has its day” and it’s a long regatta so just make sure you do well when the conditions favor your boat and when they don’t, try to minimize the damage. Day 1 was extremely tricky as the light breeze hit pretty much every degree on the compass and the courses weren’t always square. In both races, we battled back from tough spots and ended up winning both of them, one boat for boat and the other finishing second over the line but correcting to first over Wind Chill, the B36.7. We saw that our downwind speed was excellent in the light air and we passed a bunch of boats on those legs. We held our own upwind but with the small jib compared to genoas on other boats but our weapon was the big asym kite downwind. Day two called for big breeze and we were licking our chops to see what the boat could do. A WNW wind brought big waves and wind speed in the upper teens to 20 knots. We debated for a bit on the boat whether to use the big or small kite, but in the end Kris made the call to go with the smaller one knowing that we only had 5 people aboard, it would be a long day, and we could maneuver better. As it turned out, the breeze filled in even stronger and we’d have been tripping over ourselves with the A2 spinnaker. We got three really solid races in and got better as the day went on finishing the day with a 2-1-1. The last race sticks out because we lead wire to wire and had some amazing surfing/planing rides down the waves. Jim did an excellent job driving through the waves and we saw our speed increase upwind as the day went on. Downwind, we sailed the boat like a big J/70 and worked the waves and breeze to speeds in the 12-14 knot range. It was a fun day to say the least. The last day was light and very shifty. We knew we had a close battle going with “Wind Chill” and with only a 5 point lead going into the day anything could happen. They sailed an excellent final day winning both races. We had a throw out after 6 races, so we knew that we needed just one solid race to secure the win. We had a second in the first race and dropped a 4th in the last race to hold on. Overall, the J/88 performed well and held its own against much bigger boats. We ended up winning our PHRF 1 fleet and finishing 3rd overall after combining all PHRF fleets. It is a testament to the design that it can be a great one design boat, a PHRF boat, or simply a day sailing boat. In fact, our delivery crew raved about how well the boat sailed when they delivered it from Youngstown to Sodus. So in the end, LYRA was a success on the water and ashore as Dad’s article points out. Sodus Bay YC did a fine job hosting and we will be back the next time LYRA rolls through town. Thanks to the organizers and race committees who worked hard to put on a great regatta! Also, congrats to all the other division winners who take home those really cool classic perpetual trophies. We rarely see those kinds of trophies at regatta anymore, just one more neat thing about LYRA. My favorite part was looking at all the name plates from years and years ago and recognizing names and boats from when I was a kid. Sydney Boat Show Features J/70, J/88, J/111! (Sydney, Australia)- While it may be technically called “winter” in Sydney, it’s still warm, sunny and breezy outside most days (at least compared to their over the top friends in Eurasia and North America!). It is also a great time to visit Sydney and go to the Sydney International Boat Show- the largest recreational marine event in the southern hemisphere. The show is located at two great waterfront sites on Sydney Harbour: the in-water exhibits are in Cockle Bay Marina in Darling Harbour and the undercover exhibits are at the fabulous Sydney Exhibition Centre @ Glebe Island. A free ferry service operates between the two locations and the journey on beautiful Sydney Harbour takes on average 25 minutes to complete. The local J/Dealer, Yachtspot, will be displaying a J/70, J/88 and J/111 during the show that runs from 30th July to 3rd August. Come on down to the show and find out what Australians are already learning about why the International J/70 Class has been growing by leaps and bounds and is gaining momentum across Australia. Also, discover why the J/111 continues to go from strength-to-strength in Sydney and Melbourne offshore racing circles. Plus, get a chance to hop aboard the J/88 and be prepared for “shock & awe” as you hear about it’s serious turn-of-performance in the light stuff as well as its ability to “getup on the step” and simply send it downhill over 15 kts with the big A2 kite. 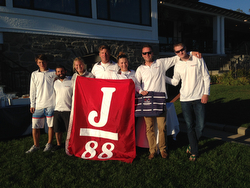 Quantum Sails Sweep 1st, 2nd, 3rd and 4th Places in the J/88 Class at the Can Am Challenge Regatta! For a new class, the J/88 has developed a nice racing fleet out of Youngstown Yacht Club. This year their Can Am Challenge Regatta on July 25, and 26, was well attended with 8 boats racing. This is the biggest J-88 regatta to date. With more events in the future, the class seems on its way to some fun racing. If you have not sailed at Youngstown, you are missing a treat. The water is beautiful, and racing in fresh water is great. Youngstown Yacht Club goes out of its way to provide the fleets with great competitive racing. Super race committees, with well-run race course management. Also their on land hospitality makes this event something that should not be missed. Overall the wind strength started at around 8 Knots and built to 20 on the final beat on Saturday. In the first two races Rob Butler sailing Touch2Play seemed like the pace setter for the fleet with convincing wins. The Next race saw Jeff and Joe Pawlowski take the win with Iris Vogel on Deviation coming from behind to edge out Touch2Play for second place, on the last run. The next two races presented the fleet with tricky shifting conditions, with a front trending the wind to the west, but with left hand shifts still in play. The Deviation crew mastered the shifts, and sailed fast for two wins to end the day. The second day presented itself with light wind out of the North West. After a postponement the Committee managed to get of two races it trying light winds. Iris Vogel managed to get of two solid starts with, challenges from Easy Eights and Touch2Play, she managed to sail fast and smart to finish off the regatta with two wins. For Iris Vogel and the Deviation team, it shows that hard work pays. 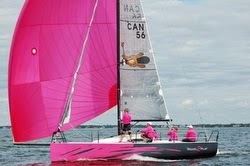 They have raced at Key West Race Week, Charleston Race Week, Block Island Race Week, and Now the Can Am Challenge. Dedication to working on the boat, improving the layout, learning to get more speed and keeping track of small refinements has led to a very successful season. Deviation was fast upwind and down wind. For Iris having support on sails and tuning from Quantum sails makes the difference – fast long lasting sails that preform. Quantum boats finished 1, 2, 3*, and 4. *3rd place finisher Easy Eights sailed with a new Quantum Jib. You can read the full results here! (Chicago, IL)- A recent update from Rich Stearns, the J/Dealer in Chicago, explained that the J/88 continues to kick up her heels and show her transom to much of the Chicago offshore fleet in local races. 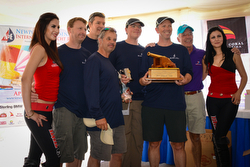 According to Rich, “J/88's continue to dominate distance racing in Chicago. Ben Wilson's RAMBLER won the rally race in the NOOD regatta and Boyd Jarrell's SLOT MACHINE took first place in the Chicago to Waukegan race, and my boat HOKEY SMOKES took 2nd overall in the Colors Regatta. You might have noticed the J/88's as a class have decided to sail the longer distance races. The owners have agreed that although some windward-leeward races are fun, they really enjoy the distance racing. So far this year the results are in, the J/88 sailors are dominating these races. For those coming by trailer, RCR Yachts will be offering mast step and launch and the reverse at the end of the regatta for FREE. J/70, J/88, J/111 @ Sydney Boat Show! (Sydney, Australia)- It is the middle of winter in Sydney, but it’s still warm, sunny and breezy. It is also a great time to visit Sydney and go to the Sydney International Boat Show- it is the largest recreational marine event in the southern hemisphere. The local J/Dealer, Yachtspot, will be displaying a J/70, J/88 and J/111 during the show that runs from 30th July to 3rd August. Come on down to the show and find out what Australians are already learning about why the International J/70 Class has been growing by leaps and bounds and is gaining momentum across Australia. Also, discover why the J/111 continues to go from strength-to-strength in Sydney and Melbourne offshore racing circles. Plus, get a chance to hop aboard the J/88 and be prepared for “shock & awe” as you hear about it’s twistedly-fast turn-of-performance in the light stuff as well as its ability to “getup on the step” and simply send it downhill on a plane with the big A2 kite. “Once again I had the pleasure to sail with Scott Grealish and crew Andrew Haliburton, Chris Thomson and Sean Grealish, on the J-88, Blue Flash. This was the first time any of us had done the 125-mile Newport to Ensenada race. The conditions proved to be challenging requiring constant sail adjustments and sail changes to keep the boat moving at optimum speed. Blue Flash is well prepared with double asymmetric tack lines on the sprit for sail changes, another fixed point on the sprit for the highly loaded Code 0's and a pad eye on the deck for the furling windseeker/spinnaker staysail. I believe one of the keys to our success was our ability and willingness to make sail changes. Bowman Chris Thomson claims he did more sail changes in that race then he has done in all of his racing combined. Chris and Sean did a great job of not only doing the sail changes, but also not complaining when it was time to do another and another and another. We used a light/medium jib, windseeker, A1, A2, large code 0 and small code 0. We probably had each one of those sails up at least 3 times each. For this race, we had a specialty/experimental small code 0 built. 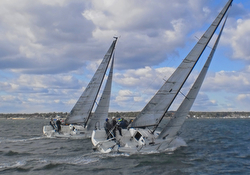 Many of the modern race boats have non-overlapping jibs with swept aft spreaders and a wide shroud base. When the wind gets light and when you are sailing slightly cracked off from closed hauled, until you can put up a free- flying sail, the boat benefits having a large overlapping headsail. However, that would require a rating hit. In order to have a larger sail for tight sailing angles, the weapon of choice is the code 0 which is measured as a free-flying downwind sail. 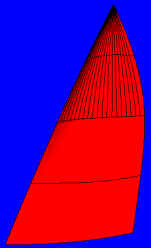 In order to measure as a free-flying sail the mid -girth has to be at least 75% of the foot length, and the sail must have no battens and a free-flying luff. The code 0 has a low stretch luff line that is put on the winch and tightened to reduce luff sag. It is usually flown on a stand-alone furler. The large code 0 sheets around the shrouds and is fairly deep, thus supporting the large spinnaker-like roach. Since the sail sheets around the wide spreaders and is fairly full, the sail does not sail to weather very well. We felt like we needed a better sail for very light upwind beating conditions. The idea that Scott Grealish, Rod Johnston, Dave Hirsch and I came up with was a code 0 that is flown at the end of the 6' 10" sprit and sheets to the jib track and in front of the spreaders. The sail could not be as flat as a jib or the battenless positive roach would just flap. The shape had to be as flat as possible but still deep enough to support the roach. The sail was built just in time for the race. Unfortunately, we did not have anytime to try it out before the race so we just went for it. We were able to sail about a 55 TWA with a gain of 76% bigger sail than the largest headsail. Our angles were deeper than a standard jib, but the difference in boat speed more than made up for it. The sail was also very useful as a blast reacher. Since the sail is on a furler at the end of the sprit, it was very easy going back and forth between it and the headsail. “The Storm Trysail BI Race on the J/88 in the doublehanded IRC division was exciting, fun, and exhausting. We (literally) had a blast all the way to Block Island from Stamford -- and got blasted all the way back on Saturday. We started off Stamford on a puffy port tack spinnaker reach at 1405 on Friday. We won the leeward start with the main and jib only in about 20 knots of breeze and decided to go with our heavy (80 square meter) spinnaker a few minutes into the race. I was worried about blowing up the big (95sm) chute in the occasional puffs over 25 knots. Control was no issue. We held even with the two J/120s for the first three hours and blew away everyone else in our class. When the wind dropped down to about 15 knots we switched to the big kite. We made it to Valiant Rock in the Race by 2130 hours and just got through before the flood began - 6.5 hours to cover the first 69 miles. Not bad for the smallest boat in the fleet. Wind dropped off and went ahead between the Race and “1-BI”. We rounded “1-BI" shortly after midnight and cleared around the south side of Block Island before 0200 on Saturday. Most of the big boats did not catch us until just before we jibed round “1-BI”. I think we rounded inside a couple of J/44s. Hard to tell in the dark. We were definitely winning our class big time at that point, because the two J/120s were not too far ahead. The fan was turned up to about 25 knots with higher gusts as we thrashed our way upwind against the current from Block Island to Plum Gut. We did not have the right sail combo available for these conditions. First, we reefed the main then rolled up the jib as it blew harder. Waves were crashing over the boat. From about 0300 to 0600, we sailed the boat like a Laser with a reefed main and no headsail. We were doing almost seven knots, but VMG was about 10 degrees lower than normal. Not good against a foul current. 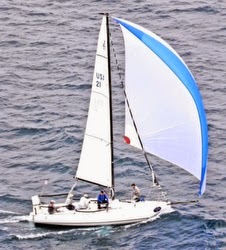 For doublehanded racing with no weight on the rail the J/88 needs a real "Yankee" jib with a short hoist and high clew. In over 20 knots, I highly recommend a second mainsail reef that we do not have, but would have used. STC required this for this race or you had to carry a storm trysail aboard (which we flew "demo' before the start but would likely never use in a race!). Another option would be to have a longer jib sheet track which extends further forward so you can roll the jib to storm jib size and just pull the jib lead forward. We did this on our J/95 (whose jib track extends way forward) a few years ago and the boat sailed great (even upwind) with the jib half rolled up in 30-40 knots of breeze with no mainsail, or a full mainsail in 20 knot winds, or reefed main in between. It was a beautiful beat with reefed main and jib from Plum Gut to Stratford Shoal in 18 knots wind when we shook out the reef. The wind dropped way off from there to the finish. Despite our relative upwind "slows " against the 35 to 46 foot boats in our class, we finished fourth boat-for-boat. The Morris 46 was the only boat to pass us on the 90 mile beat to the finish. IRC is definitely not recommended for the J/88, which gives time to the J/109 under that rule (huh?). Under PHRF, our corrected time would have put us in third place behind the two J/120s instead of fifth. This probably would have also been the case under any other handicap-rating rule other than IRC. This is the installation of the nke mechanical ram on a J88 boat, made by our american dealer Euromarine Trading in USA. Looking for a victory in the single handed Transpac next year ! (Seattle, Washington)- This month, Joe Cline, Editor at 48 North magazine, had the privilege to go out sailing on the new J/88. The first one in the area just started sailing in the last couple of months. Here is Joe’s commentary on the experience, “Ben Braden, of Sail Northwest, took us sailing and he also happens to be the person who has been racing the boat, if you've seen it on the racecourse or on the pages of our Race Reports. We had a perfect afternoon on Shilshole Bay as the entire 48° North team put the boat through her paces in a steady 10-12 knots breeze with flat water. 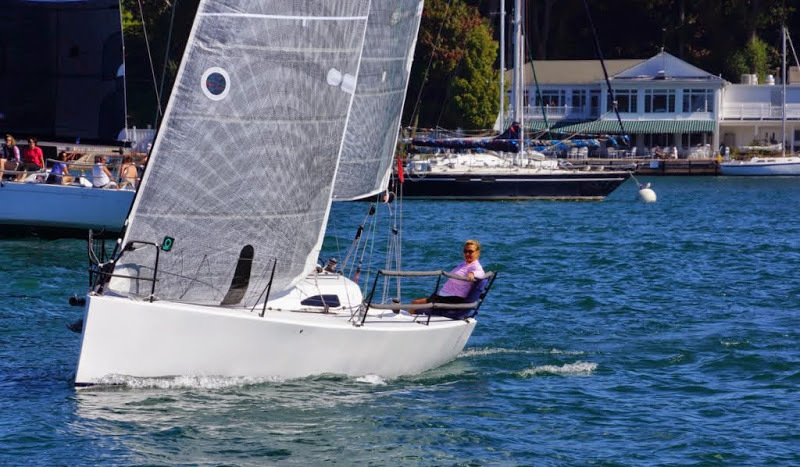 The J/88 falls neatly into the design category that J/Boats has recently had success with (J/70, J/111): a family friendly and easy-to-sail performance boat. Most people will look at these boats and think 'racer.' And indeed, they're really great for that. 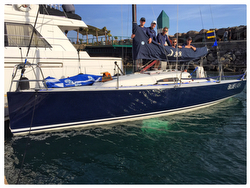 This month, we had the privilege to go out sailing on the new J/88. The rst one in the area just started sailing in the last couple of months. Ben Braden, of Sail Northwest, took us sailing and he also happens to be the person who has been racing the boat, if you’ve seen it on the racecourse or on the pages of our Race Reports. We had a perfect afternoon on Shilshole Bay as the entire 48° North team put the boat through her paces in a steady 10-12 knots breeze with at water. The J/88 falls neatly into the design category that J/Boats has recently had success with (J/70, J/111): a family- friendly and easy-to-sail performance boat. Most people will look at these boats and think ‘racer.’ And indeed, they’re really great for that. But, if you take anything away from this review, it could be that these are not boats just for hotshots. 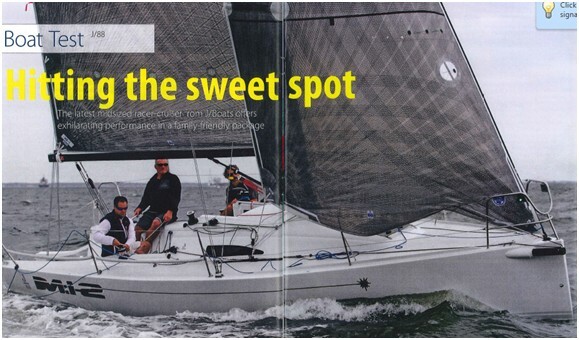 J/Boats’ marketing folks use the phrase “sweet-spot” a lot in describing the J/88. And I have to say, I agree. So, let’s look at why. The J/88 has a lot of good attributes from the world of big and small boats. At 29’ overall, with a displacement of 4,990lbs., this is a fairly substantial boat, for one with a performance pedigree. And, if you look at the displacement- to-length ratios of these recent designs, you see that the J/88’s Dspl/L of 115 is much closer to that of the 36’ J/111 (Dspl/L of 119) than that of the 22’ J/70 (Dspl/L of 91). We noticed this right away – stepping aboard, the boat barely moved under my 220 pounds. This would be the rst of many indications that this boat feels like a big 29-footer. We rigged up quickly – ease of use tends to be a design priority for J/Boats designs, and this is no different. The asymmetrical spinnaker rigging mirrors all of the similar designs, and with the exception of the creatively rigged jib in-haulers (WHOO-HOO! ), most of the controls are in the places I’ve come to expect them. The most notable thing about getting set-up to sail was the ease of raising the mainsail, thanks to the Harken Battcar slugs and mast -track system on the deck-stepped Hall Spars carbon ber rig. We motored out with the efficient little inboard diesel, and were sailing in no time. As we filled the sails and killed the engine, the boat accelerated quickly. The helm was light and the boat was easy to drive. We took off to weather, and I was immediately aware of how big the groove was on a close-hauled course. Part of this is sails and tuning, but reading other reviews, I’m not the only one who had this first impression. It’s easy to keep the boat rolling and in the (you guessed it) sweet-spot. I’ve spent quite a lot of time on the J/70, which has foil designs that are very similar to the new J/88 (obviously in a smaller package). The light and responsive helm shared a lot with the J/70, with one exception: I felt like the transom-hung rudder on the J/88 had much more bite. We did not necessarily need to ease the sails to bear away in the 12 knots we had. Overall, the boat felt powered-up but very controllable. I handed off the helm and began tweaking things – jib lead, jib inhauler, backstay. The boat is certainly tunable. The mainsail has a small flat-top and significant roach, but these are enough to allow for a single adjustable backstay. There’s plenty of juice in the mainsail, though; enough to want a twisted shape. With that, the in-haulers had a big effect on our ability to point – being able to match the twisted leech pro le in the jib and main, essentially “traveling” the bottom portion of the jib to weather – gave us several degrees of point we didn’t have before. Adjustments like that are also more typical of a bigger, racier boat. We sailed in various upwind modes – thin pinchy point, powered up with telltales streaming, etc. The boat seemed like a champ in all set-ups. Taking Ben’s advice, we sailed with a little bit more heel than I might have thought ideal for what is basically a sport boat design, but it produced great feel in the helm. After some very enjoyable upwind sailing, we drove downwind and set the big masthead asymmetrical spinnaker. The kite went up easily, and I was struck again by the multiple personalities of the boat. While it was responsive and easily driven, the J/88 had a very stable feel. The relative ease of handling and light loads were reminiscent of a smaller boat. Add to this the high speed potential, and I had the s-word in my head again: sweet-spot. Sailing downwind, we also played with the various modes. We sailed hot and fast, and even tried to induce a little wipe-out, though we couldn’t really tip it over and the spinnaker didn’t collapse until we had our apparent wind ahead of the beam. In this mode, we were making 8-9 knots in the moderate breeze. Pretty fast, in other words. Then, we sailed deeply downwind, easing the tack line a little and rotating the kite as far to weather as possible. This VMG soak mode, like you would be sailing on the racecourse in those conditions, still kept us cruising at better than 7 knots. The boat simply felt comfortable doing it all. By all accounts, the boat likes bigger breeze, too, and should start to plane in only a few more knots of breeze than we had on our test day. One notable aspect of the boat is what I found to be an extremely well designed and spacious cockpit. Once again, I found this a dance between a large and small boat design, and also somewhat a dance between racer and daysailor (or weekender). The helmsman sits on the deck, driving with a tiller extension and supporting himself with some sizable foot-pushes, in a fairly expansive space heading aft to the open transom. This driver’s area is pure small sport-boat design. In contrast, ahead of the recessed traveler bar on the cockpit sole, you nd actual cockpit seating. This would be a ne place for a headsail trimmer in many conditions, but it also makes the boat a friendlier platform for entertaining non-sailors. It’s comfortable, and gives you the secure feeling of a cockpit, while also (hopefully) keeping everybody’s tushies a little drier. We had we people aboard, and there was more than enough space for us. I found the “feel” of the J/88 particularly unique. It’s way through the water felt stiff and stable; bigger than a 29’ performance boat in its motion. Conversely, the way it handled and maneuvered, all the operations on the boat, had a quintessentially small- boat feel to me. I think this is a boat that will show well in every context it could be used in the Paci c Northwest. My guess is that it’s going to perform to its rating across the wind range, and be at home around the buoys, as well as competitive in the local distance stuff – Straits, Swiftsure, even Van Isle 360. I know J/88 owners in other parts of the country have started to do some offshore sailing in the boat, and I don’t think that’s crazy. In fact, one of my takeaways from this sail test is that this would be an extraordinary boat for shorthanded offshore racing. Double or single-handed Transpac? On the J/88, I’d go without hesitation! And for our waters, it may take the cake as the ultimate Race to the Strait boat. All of that said, again, the J/88 is not only a go-fast racer. It’s more than that, in my opinion. In the cabin, you find simple, but essential, accommodations. A real marine head, a sink, very good engine access, and sleeping accommodations for up to four, make this a boat capable of many non-racing applications. With it being so easy to sail (and sail well), the boat’s comfortable cockpit layout, and these essential amenities below, the J/88 would be a reasonable platform for a couple or small family to cruise for a weekend, or even a week in the islands that might involve an in-port shower and meal every few days. And for an easy sunset sail, throw a BBQ on the stern rail, bring the kids, and enjoy. It’s all part of the sweet-spot, if you ask me. (Cartagena, Columbia)- A J/88 recently landed in Cartagena, Columbia, that beautiful harbor and city on the northern coast along the Caribbean Sea. Her new owners, Fuad and Sam Navarros, apparently love the boat and their family is having a wonderful time sailing her in local events! 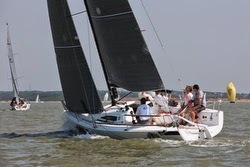 The J/88 is the second J “speedster” to join the ranks of fast offshore boats in Columbia’s offshore racing community. 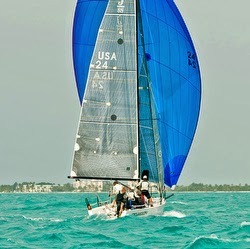 The first one was Cesar Rojas’ J/111 that sailed in Key West in 2011. (Youngstown, New York)- “Why the J88? Now that we have a couple of seasons of sailing and selling the 29 foot J88 we can answer this question with confidence. An acknowledged perk of our business is the ability to sail the newest designs as they come out, not just once or twice, but over a season or more. We have been able to do this for over 40 years, and the boats we like the most are the ones we hold onto the longest. This will be our fourth year with the J70 and the third with the J88, which will tell you what we think of these boats. There is much you can figure out by reading specs and studying equipment lists, such as the standard carbon fiber rig and retractable sprit, diesel saildrive, full race deck layout, a real marine head, etc. What you can’t really tell is how the boat sails and handles, that is where we can fill in the blanks. J/Boats has made themselves the preeminent performance boat company by focusing on what the majority of racers want. Because they are racing sailors themselves and spend a great deal of time on the water and at regattas they know their customers. They are not after the Grand Prix market, that is too small and there is very limited staying power there. J/Boats are designed to be fast and agile enough to be fun and competitive with the vast majority of the boats out there but not tweaky and skittish or demanding of excellent crew to keep the mast pointed up and the keel pointed down. The J88 is a perfect example of that, a fast boat that is fun to sail, easy to handle, and not over the top powered up. Don’t get the idea that it is not quick enough however, for unless you are looking for the ultimate in speed you won’t be disappointed. The 88 is well balanced on the helm, goes where you point it, is surprisingly close-winded and stable. The various sail tests out there (one included below) will emphasize that the 88 is nimble yet has a bigger boat feel. That is comforting when you are day-sailing, taking out friends and family, training new crew, or when the weather gets nasty. The 88 has become one of our all-time favorites because we can have so much fun with it. It is a perfect size for those who don’t need to go cruising for any length of time. The inboard engine, furling jib, marine head, real electrical system and seats in the forward cockpit make for convenience. The retractable sprit and asymmetrical kits mean easier sailing with less demand for crew experience. The deck and cockpit layout allow for comfortable places to sit. The lack of midship toerails makes for much more comfortable hiking, as does the increased spacing between upper and lower lifelines. The low deckhouse and small headsail overlap improve forward visibility upwind. We can be underway very quickly and putting the boat away after sailing is also simple. This means more time having fun and less time for chores. On the flip side all of the sail controls are there as standard equipment so you can have lots of fun fine-trimming to your heart’s content. Yes, we love the J88 and make no apologies for that. A good, solid, all-around performer designed by people who know what matters and built to last. So please tell us what more one can ask for? At least 6 J/88s racing out of Youngstown this summer: We have one of, if not the, biggest local fleet in North America. On any given race night, we could have six J/88’s on the starting line. Whether we have our own start or not, there will be great one-design racing between the boats on Lake Ontario. We found out last year that there were a lot of boats in our PHRF range that made for good competitive racing. We were given a PHRF-LO rating of 87, but raced it at 81 because of the six second “protect the fleet” penalty. That rating didn’t seem to hurt too much and still had good competition with the other Beneteau 36.7’s racing with a 78 rating, the J/109 at 80, Beneteau 10R at 92, NM Custom 30 at 93. The J/88 is tough to beat if sailed to its potential. We don’t know what the rating will be this year, but we are fine with any number between 81 and 87, knowing that we can be competitive in that range. (Port Washington, Wisconsin)- “The latest midsized racer-cruiser from J/Boats offers exhilarating performance in a family-friendly package. I have been fortunate to sail most models in the J/Boat family and I confess, I like them all. The new J/88 is an ideal blend of what makes the J/Boat brand so enduring,” said John Kretschmer from SAILING Magazine. “Falling neatly between the J/70 and J/111, the 88 might be labeled midsize if it were an automobile, but no matter what you call it, the J/Boat design and build team found the sweet spot with this 29-foot family daysailer and racer. It's a J, so it's fast and fun to sail in a variety of conditions. Its success is well documented in an auspicious debut in 2014, including second in class in the Chicago-Mackinac race. While it is small enough to be single-point lifted for easy storage and trailering, it is big enough to have an interior that's surprisingly comfortable, with enough elbowroom to extend sailing through the weekend. 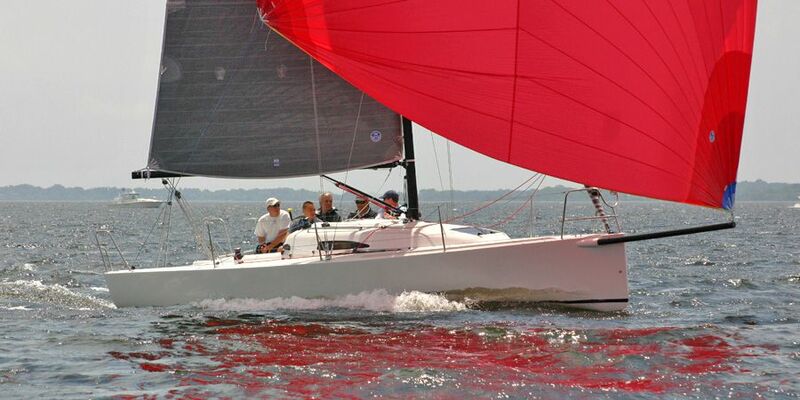 We tested the J/88 after the United States Sailboat Show in Annapolis, Maryland, and the blustery conditions were perfect for pushing the boat hard.” Sailing photo credits- Bob Grieser. Read the rest of Kretschmer’s review here. New J/88 Powered By Clean Energy! Harness the Power of the S.E.A. (Newport, Rhode Island)- Imagine sailing a beautiful boat knowing that, even if the wind dies and you’re forced to turn on the engine, peace and tranquility aren’t lost. Furthermore, imagine that every minute sailing, the battery banks are silently charging, allowing you to later push a button to silently power back to the harbor. A state-of-the-art electric propulsion and charging system from Oceanvolt is now being offered on the J/88, the 29’ state-of-the-art performance daysailer from J/Boats. J/Boats will be installing Oceanvolt’s innovative, fully integrated S.E.A. 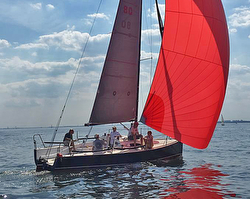 system (Silent Electric Autonomy) on their first 2016 model J/88 slated to launch mid-summer in Newport, RI and then displayed at the Newport and Annapolis Shows. The S.E.A system is electric propulsion with a twist– it has full hydro-regeneration capabilities so that batteries are recharged while sailing, with added passive recharging thanks to 500 watts of high-performance Sunpower solar cells (the world's most efficient). What’s new in the J/88 program? : We have been talking about this boat a lot over the winter. We had our demo boat in our indoor showroom for most of the winter with the exception of 10 days that we had it on display at the Toronto Boat Show. It is an easy boat to talk to customers about because of all the things that it does so well. This has become one of our all-time favorite models and we are now entering our third season with this boat as our main demo program. We had hull #2 originally, which we sold to a fellow club member and now we are sailing #27 out of Youngstown YC. It is a massive understatement to say that we are anxious to get the boat back in the water….it’s been a long winter! Why the J88? : Now that we have a couple of seasons of sailing and selling the 29 foot J88 we can answer this question with confidence. An acknowledged perk of our business is the ability to sail the newest designs as they come out, not just once or twice, but over a season or more. We have been able to do this for over 40 years, and the boats we like the most are the ones we hold onto the longest. This will be our fourth year with the J70 and the third with the J88, that will tell you what we think of these boats. There is much you can figure out by reading specs and studying equipment lists, such as the standard carbon fiber rig and retractable sprit, diesel saildrive, full race deck layout, a real marine head, etc. What you can’t really tell is how the boat sails and handles, that is where we can fill in the blanks. Jboats has made themselves the preeminent performance boat company by focusing on what the majority of racers want. Because they are racing sailors themselves and spend a great deal of time on the water and at regattas they know their customers. They are not after the Grand Prix market, that is too small and there is very limited staying power there. 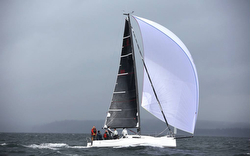 Jboats are designed to be fast and agile enough to be fun and competitive with the vast majority of the boats out there but not tweaky and skittish or demanding of excellent crew to keep the mast pointed up and the keel pointed down. The J88 is a perfect example of that, a fast boat that is fun to sail, easy to handle, and not over the top powered up. Don’t get the idea that it is not quick enough however, for unless you are looking for the ultimate in speed you won’t be disappointed. The 88 is well balanced on the helm, goes where you point it, is surprisingly close-winded and stable. The various sail tests out there (one included below) will emphasize that the 88 is nimble yet has a bigger boat feel. That is comforting when you are day-sailing, taking out friends and family, training new crew, or when the weather gets nasty. Yes we love the J88 and make no apologies for that. A good, solid, all-around performer designed by people who know what matters and built to last. So please tell us what more one can ask for? 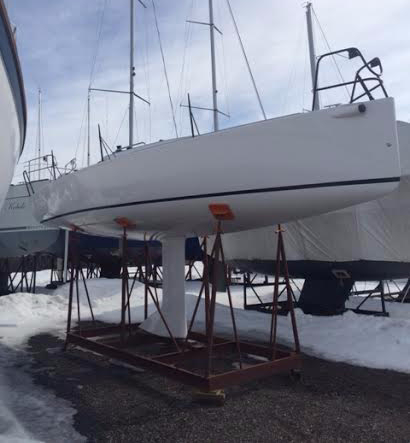 A More Cruising / Day Sailing Version of the 88: J/Boats is currently spec'ing out a demo J/88 to be launched in Newport mid-summer and then displayed at the Newport and Annapolis Shows. It will feature a state-of-the-art electric propulsion system with regeneration capabilities so that batteries are recharged while sailing. Add to this a self-tacking jib, Awlgripped dark hull, dodger and a teak cockpit sole and this special J/88 will be ready to show off all of its J/100-like day sailing qualities. We look forward to sharing more details in the near future. We have hull #76 coming later this month. 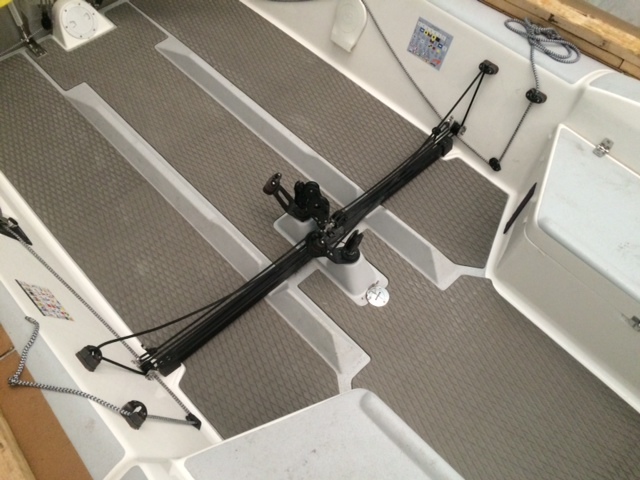 It is ordered with Carbon Fiber Mast, Yanmar 14HP Diesel w/Saildrive, Cradle, V Berth Package, Two Tone Deck, Flag Blue Boot Stripe, Black Stanchions & Rails, 2 Opening Ports in Cockpit, Salon Cushions, 2nd Battery. Our stock boat is your best bet to be sailing right away this spring. Two ways to Launch: The 29 foot J/88 weighs a hair under 5,000 pounds. We typically launch ours with RCR's marine travelift, but as you can see below, the boat has the ability to be crane launched with the single point lifting straps. 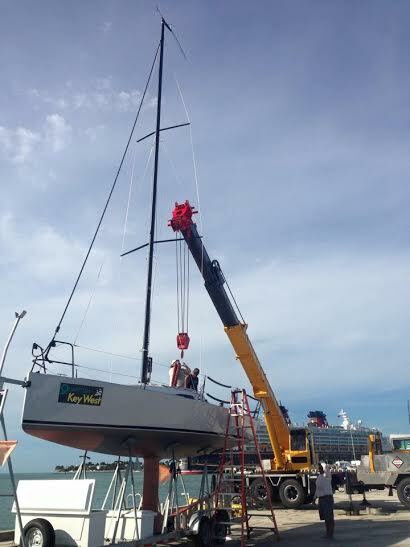 Here is Hull #11, "Night Owl" getting plucked from her trailer in Key West this winter. Electronics: You have several options when adding electronics to your boat and you can go with a very inexpensive package up to the deluxe high end package. It really comes down to your wants and needs for your program. 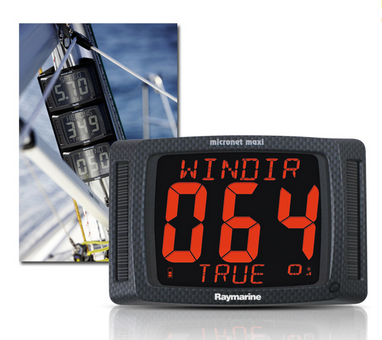 We have seen some boats go as simple as the Velocitek Shift and ProStart only on the mast, we’ve seen some use B&G, and we have the Raymarine wireless package on our demo boat. When it comes time to order, we have you sit down with our certified electronics installers to discuss the pros and cons of each and narrow it down the right package for your boat. 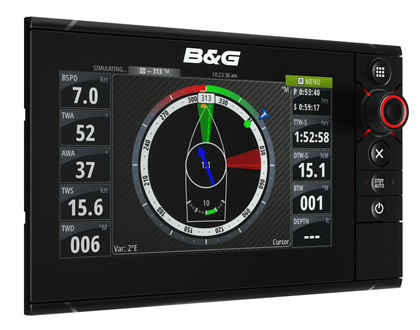 For the B&G systems, you can go in a number of ways. The 88 in Youngstown went with the VHF v50 with wireless handset, the Zeus Touch 7, two standard Triton displays in the companionway and three repeater displays on the mast bracket. They also added a sonic hub. 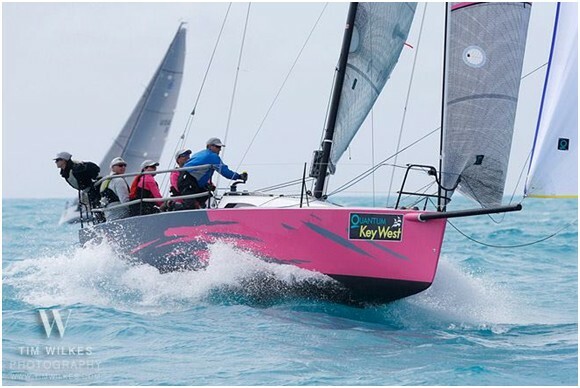 Quantum Key West Race Week Report, by Larry Huibers: Touch 2 Play had the great fortune of participating in what would be the largest yet gathering of J88’s to date. 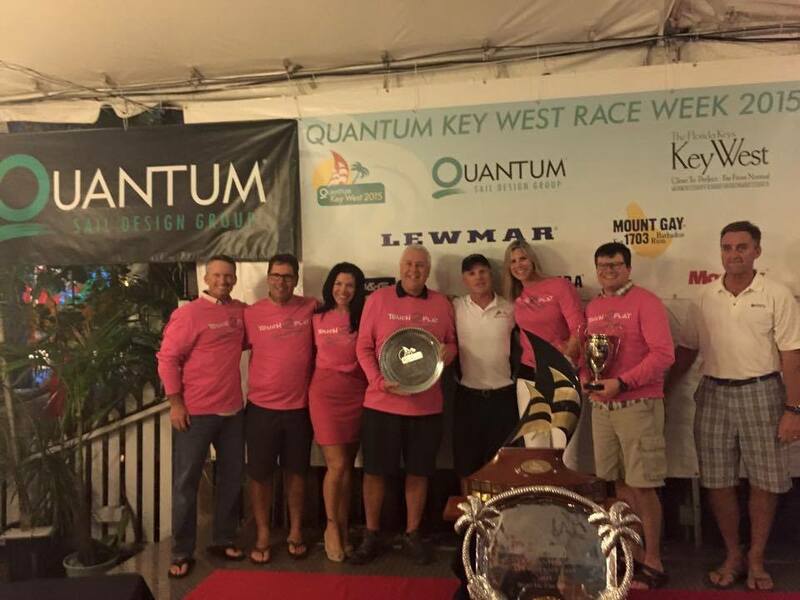 Quantum Key West Race Week would serve as a chance to see how boats lined up against one another in conditions that covered the full range. For this event we had Rob and Sandy Butler, Steve Liebel, Keven Piper, Coleen Walsh and myself, Larry Huibers. The 5 other 88’s racing included Youngstown locals; Easy Eights (Joe/Jeff Pawlowski) and Night Owl (Rick Lohr), Deviation from New Rochelle, Instant Karma from Southampton and Saralysia from Port Sanilac. I have been lucky enough to be with the Butlers on their last few boats and when Rob was looking for the next one, the J/88 hit all the marks, easy to race and manage, comfortable yet performance focused. To really drive home the dual value of the boat, we sailed it down and back to Key West from Naples, Florida. We delivered the boat from Naples in what will be one of the nicest sailboat rides I have had. We had about 100 miles of downwind sailing in winds ranging from light to 20 knots. We ran the diesel all the way to keep the batteries charged and make sure we stayed on schedule. We left at 7pm, high tide with an ETA to the Key West reporting buoy for 7am. With following seas and bursts into 13 + knots we needed to slow down a little near dawn so we could navigate in the channel in better light. We had a magical hour where dolphins were playing in our bow wave trying to get as close as possible to the boat. It was very cool. We got to the Galleon dock by 8am, grabbed a quick nap and began prepping the boat to race. Off came all the cruising stuff, jack lines, etc. and we were ready to go pace against other boats. Saturday we found a couple of boats and found our pace to be a little off. Lots of chatter and we narrowed our swings down ready to try again Sunday. Sunday was better and we felt OK going into race day. 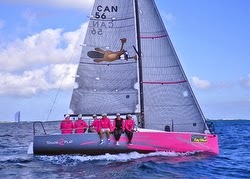 Quantum Key West Race Week is a bit of a carnival with some of the coolest boats racing there. Seeing the foiling cats rip around was impressive. Ask Flip (Wehrheim of Rochester YC) about it, he was on one of them and said the speed was unbelievable. The new C&C 30 was there looking very good as well as a bunch of high end race teams. We started slow with a 3, 2 day one but felt we were getting things figured out. Day 2 had us finish 1, 1 so feeling better about the mid teen wind speed mode. Wednesday was really light with a shore side AP. We finally got in one race and we struggled in the really light stuff finishing 4th. Not how we wanted to end the day but a couple of rummers later we convinced ourselves we were where we needed to be. Thursday was moving day for us with 3 races scheduled. We finished 2nd to Deviation on the first race and now spotted them some points. The next race called for us to put boats between Deviation and us. We provided a loose (ok maybe not loose) cover on them rounding the first 3 marks in 5, 6th. On the sprint to the finish we kept one boat between us and we were 3rd to Deviation’s 5th. Steve and Keven figured we only needed to win all the remaining races to win the division, how hard could that be? So that’s what we did, finishing with a 1, 1, 1 and winning the series tie-breaker. We won our division at Key West in 2012 on Carbonado and that was huge, this was even more rewarding because of the consistent improvements in crew work, boat handling and speed. It may go down as the second greatest comeback in sailing every, behind some cat race out west. All the boats went better as the week went on and the differences were measured in a foot here, a little higher point there. Things we learned in no real order are. We use a downhaul line for the kite and found this was very helpful but as was pointed out at the video debrief all the boats held kites too long and bottom rounding never looked perfect for anyone. We followed the Quantum tuning guide and all boats were open to sharing their numbers; everyone wanted to get to get faster and collectively this was accomplished. Main sail trim is critical, lots of burping it to keep the boat on its feet. We could count feet gained when done right, just as easy to count feet lost when done wrong. We learned from Deviation to carry the traveler really high and narrow the slot with lots of in-hauler on the jib. We hiked very aggressively, at least that’s what my guts tell me. Downwind we searched and finally found the right mode for best VMG. It was really easy for me, as the kite trimmer, to lull us into too much of a soak mode or feel like a hero heating up to a fast number. In breeze we kept the jib out, that helped a lot. We found that when the boat slowed down it took a really long time to get back to speed so when the boat decelerated you needed to do something positive right away. For an effective lee bow you had to be about a ½ boat length ahead just to be able to get back to speed to pull it off. Anything under 10 knots of wind speed and pressure is king; it made the difference in knots of boat speed. Steve said early on, make the boat go fast and he’ll look like a brilliant tactician. Well for this event we put 95% of our collective energy into going fast and by the slimmest of margins Steve remains a brilliant tactician. Congratulations to all the class winners and the entire J/88 fleet for making this event enjoyable. Thanks to Rob and Sandy who took excellent care of us all week. Oh and the return delivery was almost as fun, until the wind swung from the South to the North and the rain came and the lightening came and the waves came, it was great just in a different, wet, bouncy way. A Personal Touch to Quantum Key West Race Week, By Kerry Klinger: As head of the J/Boat Division for Quantum Sails, my perspective and role at Quantum Key West Race Week was not only that of tactician and trimmer on the J/88 Deviation, but also making sure all our customers and sails in the J/111 and J/88 classes performed well. My goal at regattas is always to help our clients get up to speed in any way possible and facilitate the flow of information between successful boats. J/Boats are in a performance class all their own and in the J/Boat Division our focus is on the requirements of these boats while providing owners with all the support and information they need for success. This concentration is evident in the J/111 where our customers have had great success since the inception of the boat. I want to acknowledge Gary Leduc and Wally Cross who have both contributed a lot over the years to the development of the J/111 sails and the tuning guide. It is very rewarding to work with these professionals who are key in evaluating sails, learning the nuances of the boat, and striving to make the best sails possible. This team approach to sail development has led to some very fast sail inventories. 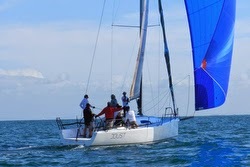 For the J/88 class, Key West is the second largest regional regatta for a new boat. This makes for some unknowns in regards to how fast your sails and boat are compared to the competition. For our crew on Deviation the goals were simple. First, get to the regatta early, set up the boat, work on slight boat improvements, and go sailing. Second, practice, try to line up with the competition, and see how fast we were. One of our advantages on Deviation was the season of sailing we had under our belt. The disadvantage was the fact our sails were one season old. Last year, I raced with owner Iris Vogel at Block Island Race Week and as a result, instituted some sail development improvements now part of our current products. Rob Butler on Touch2Play benefited from these improvements in his newly purchased sails. To overcome this, Deviation’s sails were brought into the loft for service and were adjusted to current designs wherever possible. The biggest change was made to the A2 Asymmetrical, where the head of the sail was replaced. This adjustment was made to increase twist in the sail and make the head slightly deeper. During the week, Touch2Play and Deviation proved to be the fastest J/88s out there. We worked with daily debriefs on what we thought were fast combinations. Details were exchanged on rig settings, inhaul amount, and sheet tension. Overall, the boats proved to be very close in speed. An important thing we learned was that the main could be sheeted with the boom above centerline in the lighter winds. Our tuning guide (available here) is pretty accurate, and the headstay length seemed to work well. In light winds we were between 1.5 and 2 steps below base setting. In the windy conditions we were two steps up. In the last few races we did not realize that our shims fell out of the rudder pintles and two bolts backed out, causing trouble after the last race. I am sure we were slowed down the last day because of this. Other owners should check their pintles and bolts to insure they are properly installed and working well. In the end, Touch2Play and Deviation tied with 19 points, with Touch2Play winning on the tie-breaker. The next closest boat had 34 points. Between the two boats, they won 9 of the 10 races. From where I sit, that’s nearly a perfect ending! J/88 & J/70 @ Strictly Sail Show! Unlike the carbon mast, the boom is aluminum. I like that the gooseneck is high enough to make it easy to stay clear of the boom when tacking, a small thing maybe, but just the type of thinking that makes Js unique, family friendly and highly competitive. The Harken headsail furler is mounted below deck, and the vang can be fixed to either side. In-haulers foster tight sheeting angles. Like all Js, the nonskid works well– it's not too aggressive but you feel secure moving about the deck underway. Sailing across the bay, we executed a series of quick tacks to avoid shoal water. The acceleration was impressive, and we quickly sped past 7 knots sailing very close to the wind. Well placed foot supports made it easy to cope with a fair bit of heel on both tacks. I was impressed by how solid the boat felt in the water. While the J/88 handles like a small boat, it definitely has a big boat ride. The cooler is located underneath the companionway steps. The hull shape has long ends with a near plumb stem and stern, and yet the boat doesn't pound in a chop. 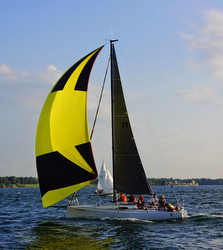 The fin keel, with a very low VCG, provides a smooth foil and keeps the boat on its feet. The draft is 6 feet 6 inches. The hull and deck are cored, and joined on an inward flange. The overall quality of finish is superb but the effect is purposefully not showy. I was a bit surprised when David suggested we fly the kite, being shorthanded in a big breeze, but I was delighted to oblige. He went forward, deployed the sprit, and my friend Jose cranked the halyard. I steered off a bit and soon we were flying at double digit speeds. J/Boats specified a 95-square-meter asymmetrical sail for the spinnaker–an easy-to-handle size that still provides plenty of horsepower. And horsepower we had. Despite being overcanvassed, the steering was quite manageable. When it became obvious that we were leaving the photo boat behind, we jibed over and headed south. We carried the A-sail up to 70 degrees, feathering the main occasionally but overall we had no trouble keeping the boat on its feet. The level of boat control in winds that were gusting at times well above 20 knots was impressive. The transom-hung rudder provides dinghylike control. There is plenty of room in the open cockpit for racing action. We sailed up the channel and furled the jib and dropped the main at the last moment. 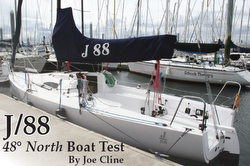 It was an exhilarating boat test and one that epitomized the versatility of the J/88. On a day when most daysailors would have been hunkered down, we were blasting back and forth across the Chesapeake Bay. And while most bigger boats would have doused sail in the broader reaches outside the channel, we eased right up to the slip under sail. The J/88 really is the sweet spot for modern sailing. A family-friendly boat that offers performance that seasoned sailors appreciate, this quality design from one of America's premier builders fits neatly into the life of today's busy sailors. It's no surprise that the J/88 is becoming one of J/Boat's most popular models. J/88 | LOA 29'2" | LWL 26'10" | Beam 9'6" | Draft 6'6" | Ballast 1,840 lbs. | Displacement 4,990 lbs. | Sail area 439 sq. ft.
“My perspective and role on-board was not only that of tactician and trimmer on the J/88 DEVIATION, but also to help our customers get up to speed in any way possible and facilitate the flow of information between good boats. 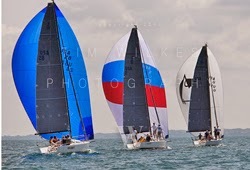 F or the J/88 class, Key West is the second largest regional regatta for a new boat. This makes for some unknowns in regards to how fast your sails and boat are compared to the competition. For our crew on Deviation the goals were simple. First, get to the regatta early, set up the boat, work on slight boat improvements, and go sailing. Second, practice, try to line up with the competition, and see how fast we were. During the week, Touch2Play and Deviation proved to be the fastest J/88s out there. We worked with daily debriefs on what we thought were fast combinations. Details were exchanged on rig settings, in-haul amount, and sheet tension. Overall, the boats proved to be very close in speed. An important thing we learned was that the main could be sheeted with the boom above centerline in the lighter winds. Our tuning guide was pretty accurate, and the headstay length seemed to work well. In light winds, we were between 1.5 and 2 steps below base setting. In the windy conditions, we were two steps up. In the last few races we did not realize that our shims fell out of the rudder pintles and two bolts backed out, causing trouble after the last race. I am sure we were slowed down the last day because of this. Other owners should check their pintles and bolts to insure they are properly installed and working well. J/88s Planing Assault on Chicago-Mac Race! 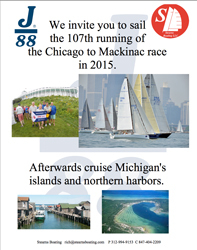 (Chicago, Illinois)- Rich Stearns, from Stearns Boating in Chicago, is inviting all J/88 sailors to join them for the 107th running of the Chicago to Mackinac Island race, starting on July 11th. Then, afterwards do a short cruise to the spectacular North Channel/ Georgian Bay (simply imagine cruising “Downeast” Maine, but in crystal clear Caribbean-blue fresh water!) and/or sail in the equally fabulous Harbor Springs Regatta on Little Traverse Bay from July 24th to 28th. There are six J-88’s in Lake Michigan that are doing the race, plus three out-of-towners joining them. A total of nine boats so far! Why not “take a crack at the Mac” yourself!? With a J/88 on a trailer, it simply cannot get any easier. Tow or get your J/88 delivered to Chicago. Launch if for FREE at Chicago YC’s 5-ton hoist, using a single-point lift. Plus, they have a tall “gin pole” right there at CYC that can hoist your incredibly light carbon rig with your kids! Once the boat is in the water, Stearns Boating and CYC are offering awesomely cheap rates to dock the boats until the start of the Mac. Your trailer gets taken care of and delivered (or towed) dirt cheap to Mackinac City, right next to the Mackinac Bridge! Shepler’s Marina will pull the boat for $200 USD! Heck, that’s cheaper than doing your kids Opti regattas! Or, if you’re doing the Mac Race and staying for Harbor Springs, Stearns Boating can help organize your trailer delivery to Irish Boat Shop (another J/Dealer) and have it pulled at their marina by Mike Esposito (a famous J/World rock-star!). In order to help your decisions regarding logistics and the all-important “fun-factor”, Rich and his wife Lori wrote a fantastic guide for any sailor, but in particular, J/88 sailors. The first guide is called “The Perfect Boat- or why everyone should own a J/88” (download the PDF here- http://www.jboats.com/images/stories/pdf/J88_PerfectBoat.pdf). He’s not kidding! The second document is called “J/88 Chicago-Mac Invite and Cruising Guide” (download the PDF here- http://www.jboats.com/images/stories/pdf/J88_ChicagoMac.pdf). This latter document is so good, ANY sailor doing the Chicago-Mac Race should download it because it’s a race, cruise and logistics guide all in one! We started slow with a 3,2 day one but felt we were getting things figured out. Day 2 had us finish 1, 1 so feeling better about the mid teen wind speed mode. Wednesday was really light with a shore side AP. We finally got in one race and we struggled in the really light stuff finishing 4th. Not how we wanted to end the day but a couple of rummers later we convinced ourselves we were where we needed to be. Thursday was moving day for us with 3 races scheduled. We finished 2nd to Deviation on the first race and now spotted them some points. The next race called for us to put boats between Deviation and us. We provided a loose (ok maybe not loose) cover on them rounding the first 3 marks in 5, 6th. On the sprint to the finish we kept one boat between us and we were 3rd to Deviation’s 5th. Steve and Keven figured we only needed to win all the remaining races to win the division, how hard could that be? So that’s what we did, finishing with a 1, 1, 1 and winning the series tie-breaker. Congratulations to all the class winners and the entire J/88 fleet for making this event enjoyable. Thanks to Rob and Sandy who took excellent care of us all week. Oh and the return delivery was almost as fun, until the wind swung from the South to the North and the rain came and the lightening came and the waves came, it was great just in a different, wet, bouncy way. See you all at Charleston. J/88 UK National Championships Announcement! (Cowes, Isle of Wight, England)- The rapid expansion of the new J/88 fleet means they will enjoy their first National Championships at The Landsail Tyres J-Cup in Partnership with B&G, hosted by the Island Sailing Club in Cowes from 11th – 13th June 2015. The J/88 is the latest addition to J/Boats’ Sport range. Designed to be versatile and easy to handle, she is also a sleek and super-quick combination of sail-power and stability, with a huge social cockpit, push-button diesel engine, below-decks head, deck-stepped carbon mast, single-point lift and much more. The fifteenth edition of the J-Cup will also incorporate the National Championships for the J/97 and J/109. One of the few regattas which has seen steady or increased entry numbers in recent years, the J-Cup is exclusively for yachts of the J/Boats brand, and entails three days of racing coupled with lively socials. The unrivaled spirit of the regatta is largely credited to the close-knit community of owners who enjoy long relationships with their boats. For more J/88 UK Nationals and J/Cup sailing info. Got some news form 2015?